Officer Wood was shot and killed by an armed juvenile. The 39-year-old victim responded to Jordan Meadows Park, 2350 W. 7510 South, on a report of a family disturbance. Officer Wood was flagged down by the suspect’s father who stated that he had followed is son to the park after being threatened with a pistol. As Officer Wood entered the park, the 17-year-old suspect fired on him from ambush. Officer Wood was struck in the head and died after being airlifted to University Hospital. The suspect committed suicide an hour later as officers closed in on him. Married for 18 months, Officer Wood was laid to rest in West Jordan City Cemetery. 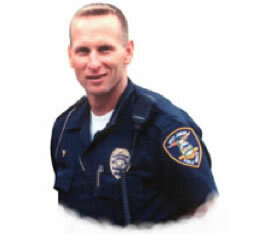 His bronze name plaque is sponsored by the West Jordan Police Department. To the family of Officer Wood. May God always shine on you through your grief and loss. Still miss the heck out of you Woody. Think about you often… You truly were one of my favorite officers to work for and was the utmost professional in every aspect of police work. Big hugs to you wherever you may be and know you will not be forgotten. Miss you my friend. Seems like only yesterday we were playing softball. Those were good times. What and honor it was to even know you and better to be your friend. And now your name lives on and cherished to have the ball park named after you. I will always knock on wood. Peace brother. I was Elder Wood’s first companion on his mission. The end of our assignment together was the last time I ever talked to him in person – just a few phone calls and sitting in his Homecoming to hear him speak. He was such a good guy. Quick to smile with an infectious smile – he brought light and smiles to every place he went. You know – you just think that you are young and there will be a time in the future when you can get together. I put it off – I put him off – work, raising a family, serving in the church – easy to feel too busy.